(Francisco Kjolseth | The Salt Lake Tribune) Stand up paddle board enthusiasts Roxy Christensen and Chris Knoles take to the water at Bountiful Pond on Tuesday, Oct. 30, 2018, in what has become a Halloween tradition for the 4th year in a row as they dressed up this year as Jack and Sally Skellington from the movie Nightmare Before Christmas. We paddle year round but actually paddle more in the winter, exclaimed Knoles, who carry the tradition on at Christmas, dressing up in something festive and paddling on the Great Salt Lake where the high salinity usually keeps the water from freezing. (Francisco Kjolseth | The Salt Lake Tribune) Stand up paddle board enthusiasts Chris Knoles and Roxy Christensen take to the water at Bountiful Pond on Tuesday, Oct. 30, 2018, in what has become a Halloween tradition for the 4th year in a row as they dress up this year as Jack and Sally Skellington from the movie Nightmare Before Christmas. We paddle year round but actually paddle more in the winter, exclaimed Knoles, who carry the tradition on at Christmas, dressing up in something festive and paddling on the Great Salt Lake where the high salinity usually keeps the water from freezing. 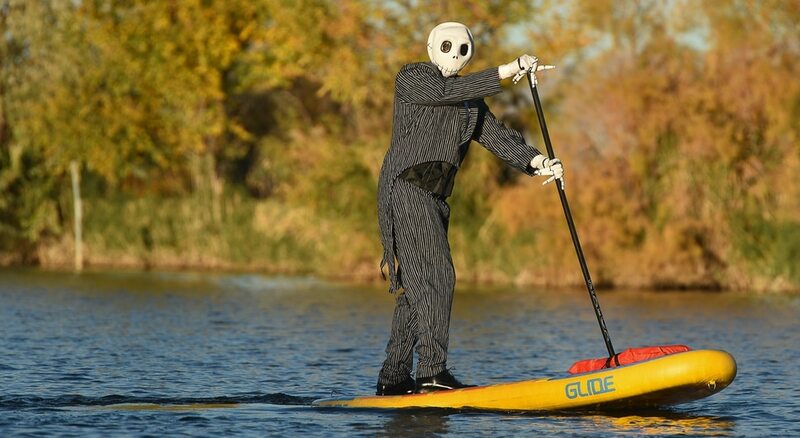 (Francisco Kjolseth | The Salt Lake Tribune) Stand up paddle board enthusiast Chris Knoles takes to the water at Bountiful Pond on Tuesday, Oct. 30, 2018, in what has become a Halloween tradition for the 4th year in a row as they dress up this year as Jack and Sally Skellington from the movie Nightmare Before Christmas. We paddle year round but actually paddle more in the winter, exclaimed Knoles, who carry the tradition on at Christmas, dressing up in something festive and paddling on the Great Salt Lake where the high salinity usually keeps the water from freezing. 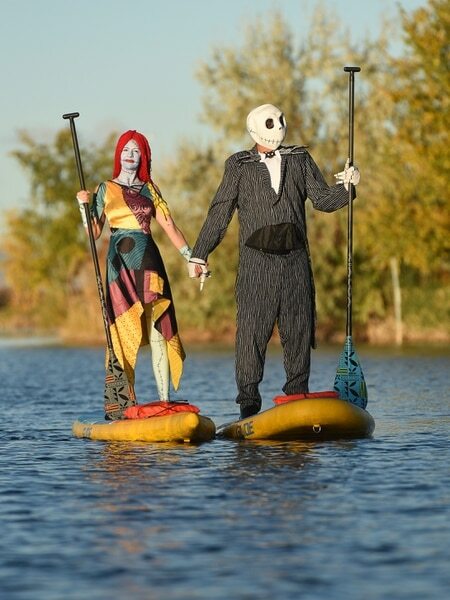 (Francisco Kjolseth | The Salt Lake Tribune) Stand up paddle board enthusiasts Roxy Christensen and Chris Knoles, not pictured, take to the water at Bountiful Pond on Tuesday, Oct. 30, 2018, in what has become a Halloween tradition for the 4th year in a row as they dress up this year as Jack and Sally Skellington from the movie Nightmare Before Christmas. We paddle year round but actually paddle more in the winter, exclaimed Knoles, who carry the tradition on at Christmas, dressing up in something festive and paddling on the Great Salt Lake where the high salinity usually keeps the water from freezing. (Francisco Kjolseth | The Salt Lake Tribune) Stand up paddle board enthusiast Chris Knoles takes to the water at Bountiful Pond on Tuesday, Oct. 30, 2018, in what has become a Halloween tradition for the 4th year in a row as they dress up this year as Jack and Sally Skellington from the movie Nightmare Before Christmas. We paddle year round but actually paddle more in the winter, exclaimed Knoles, who carry the tradition on at Christmas, dressing up in something festive and paddling on the Great Salt Lake where the high salinity usually keeps the water from freezing. (Francisco Kjolseth | The Salt Lake Tribune) Stand up paddle board enthusiasts Chris Knoles and Roxy Christensen take to the water at Bountiful Pond on Tuesday, Oct. 30, 2018, in what has become a Halloween tradition for the 4th year in a row as they dress up this year as Jack and Sally Skellington from the movie Nightmare Before Christmas. We paddle year round but actually paddle more in the winter, exclaimed Knoles, who carry the tradition on at Christmas, dressing up in something festive and paddling on the Great Salt Lake where the high salinity usually keeps the water from freezing. (Francisco Kjolseth | The Salt Lake Tribune) Stand up paddle board enthusiasts Chris Knoles and Roxy Christensen take to the water at Bountiful Pond on Tuesday, Oct. 30, 2018, in what has become a Halloween tradition for the 4th year in a row as they dress up this year as Jack and Sally Skellington from the movie Nightmare Before Christmas. We paddle year round but actually paddle more in the winter, exclaimed Knoles, who carry the tradition on at Christmas, dressing up in something festive and paddling on the Great Salt Lake where the high salinity usually keeps the water from freezing. 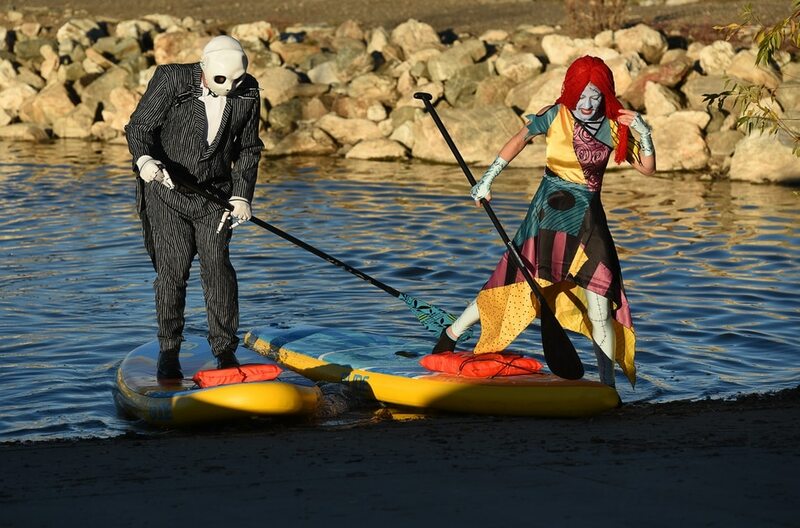 (Francisco Kjolseth | The Salt Lake Tribune) Stand up paddle board enthusiasts Roxy Christensen and Chris Knoles take to the water at Bountiful Pond on Tuesday, Oct. 30, 2018, in what has become a Halloween tradition for the 4th year in a row as they dress up this year as Jack and Sally Skellington from the movie Nightmare Before Christmas. We paddle year round but actually paddle more in the winter, exclaimed Knoles, who carry the tradition on at Christmas, dressing up in something festive and paddling on the Great Salt Lake where the high salinity usually keeps the water from freezing. (Francisco Kjolseth | The Salt Lake Tribune) Stand up paddle board enthusiasts Chris Knoles and Roxy Christensen take to the water at Bountiful Pond on Tuesday, Oct. 30, 2018, in what has become a Halloween tradition for the 4th year in a row as they dress up this year as Jack and Sally Skellington from the movie Nightmare Before Christmas. We paddle year round but actually paddle more in the winter, exclaimed Knoles, who carry the tradition on at Christmas, dressing up in something festive and paddling on the Great Salt Lake where the high salinity usually keeps the water from freezing. (Francisco Kjolseth | The Salt Lake Tribune) Stand up paddle board enthusiasts Chris Knoles and Roxy Christensen take to the water at Bountiful Pond on Tuesday, Oct. 30, 2018, in what has become a Halloween tradition for the 4th year in a row as they dress up this year as Jack and Sally Skellington from the movie Nightmare Before Christmas. We paddle year round but actually paddle more in the winter, exclaimed Knoles, who carry the tradition on at Christmas, dressing up in something festive and paddling on the Great Salt Lake where the high salinity usually keeps the water from freezing. (Francisco Kjolseth | The Salt Lake Tribune) Stand up paddle board enthusiasts Chris Knoles and Roxy Christensen take to the water at Bountiful Pond on Tuesday, Oct. 30, 2018, in what has become a Halloween tradition for the 4th year in a row as they dress up this year as Jack and Sally Skellington from the movie Nightmare Before Christmas. We paddle year round but actually paddle more in the winter, exclaimed Knoles, who carry the tradition on at Christmas, dressing up in something festive and paddling on the Great Salt Lake where the high salinity usually keeps the water from freezing. Stand-up paddleboard enthusiasts Chris Knoles and Roxy Christensen took to the water at Bountiful Pond on Tuesday in what has become a Halloween tradition. For four years in a row they have dressed up, this time as the characters Jack and Sally Skellington from the movie “The Nightmare Before Christmas.” Last year it was Chewbacca and Rey from the Star Wars movies. “We paddle year-round but actually paddle more in the winter,” said Knoles, who carries on the tradition at Christmas, dressing up in something festive and paddling on the Great Salt Lake, where the high salinity usually keeps the water from freezing.